32 Labels, 222CDs, 750+ Performers & Ensembles, 280 Hours of Music, 10 Hours of New Recordings including 7 World Premieres, 2 luxury hardback books, advance presentation of BWV3 Catalogue, plus digital product suite. Deutsche Grammophon and Decca proudly announce the release of the largest and most complete box set ever devoted to the work of a single composer. The 222 CD Complete Edition is the result of two years of curation and scholarship and has been developed with the cooperation of 32 labels and a team of scholars at the Leipzig Bach Archive, with an introductory DVD documentary and written welcome by its President Sir John Eliot Gardiner, and with editorial consultant Nicholas Kenyon presiding over work-by-work musical commentary. The set marks 333 years since the birth of J.S. Bach. We can confidently say that certain numbers and numerical proportions had a special structural and sometimes religious significance for Bach. References to the number three reflect the important doctrine of God’s Tri-unity which lies at the core of Bach’s Lutheran faith. Nicholas Kenyon says: “333 is important, because one of the key Bach numbers is 3 representing the Trinity: Father, Son and Holy Ghost. The symbolism of three, and three times three, is everywhere in the collection of organ works Clavier-Übung III (1739). We often sense these underlying features in Bach’s work; while I don’t think he ever let them dominate his thinking, it was clearly a way in which he was expressing the harmony of the universe as he saw it.” The set is thus known as ‘Bach 333’. Across 16,926 minutes of music over 5,533 tracks, Bach 333 presents every known note from the great master and opens up his world – and his impact on our world – in a uniquely immersive way: through audio, visual, printed and online materials. The set, the largest ever devoted to a single composer and exceeding in size even the massively-successful ‘Mozart 225’ Edition of two years ago, presents Bach’s complete oeuvre from 750 hand-picked performers and ensembles across 32 labels including Sony, Warner, BIS, SDG, Denon and Harmonia Mundi. Two handsomely illustrated hardback books are included. The first book, entitled LIFE, presents a lavishly illustrated biography by leading Bach scholar Dorothea Schröder plus thirteen essays of the latest thinking from leading scholars from the Leipzig Bach Archive. The second book, MUSIC presents a new essay by doyen of Bach scholarship Christoph Wolff followed by work-by-work commentary by Nicholas Kenyon (author of The Faber Pocket Guide to Bach). Also included are complete sung texts and English translations, facsimile reproductions of key scores and a guide to further online resources including the Bach Archive’s ground-breaking Bach Digital initiative. Meanwhile, the set also conforms to the very latest research from the Leipzig Bach Archive and their new BWV3 catalogue due to be published in 2019-20. The life of Bach is further explored on DVD in Sir John Eliot Gardiner’s 90-minute BBC film ‘Bach: A Passionate Life’. The colour-coded layout of Bach 333 presents the works chronologically within one of four genres – Vocal Music, Keyboard Music, Orchestral Music and Instrumental Music. The consumer can navigate with ease across the enormous and rich array of content. Best-in-class historically-informed performances include a handpicked set of the complete Cantatas led by outstanding contributions from Sir John Eliot Gardiner and Masaaki Suzuki, plus strong showings from Ton Koopman, Philippe Herreweghe, Gustav Leonhardt, Nicolaus Harnoncourt, Sigiswald Kuijken and more; other leading names featured across the Edition include Reinhard Goebel, Christopher Hogwood, Paul McCreesh, Franz Brüggen, Trevor Pinnock, Christophe Coin, Christophe Rousset and Rinaldo Alessandrini. The set also presents over 50 CDs of alternative recordings including modern piano performances of all the key works from András Schiff, Murray Perahia, Angela Hewitt, Martha Argerich, Alfred Brendel and many more. 90 years of evolving Bach performance traditions in vocal and instrumental practice can be heard in legendary performances from a plethora of artists from Alfred Deller to Lorraine Hunt Lieberson, Adolf Busch to Claudio Abbado, Willem Mengelberg to Karl Richter, Edwin Fischer to Glenn Gould, Albert Schweitzer to Marie-Claire Alain, Wanda Landowska to Zuzana Růžičková, Pablo Casals to Pierre Fournier, Arthur Grumiaux to Anne-Sophie Mutter. Highlights among 10 hours of entirely new recordings include a new recording of the Sonatas & Partitas for solo violin by period specialist Giuliano Carmignola, as well as 7 premieres of works never recorded before - 6 alternative Chorale versions and Beethoven’s only completed arrangement of a Bach work. 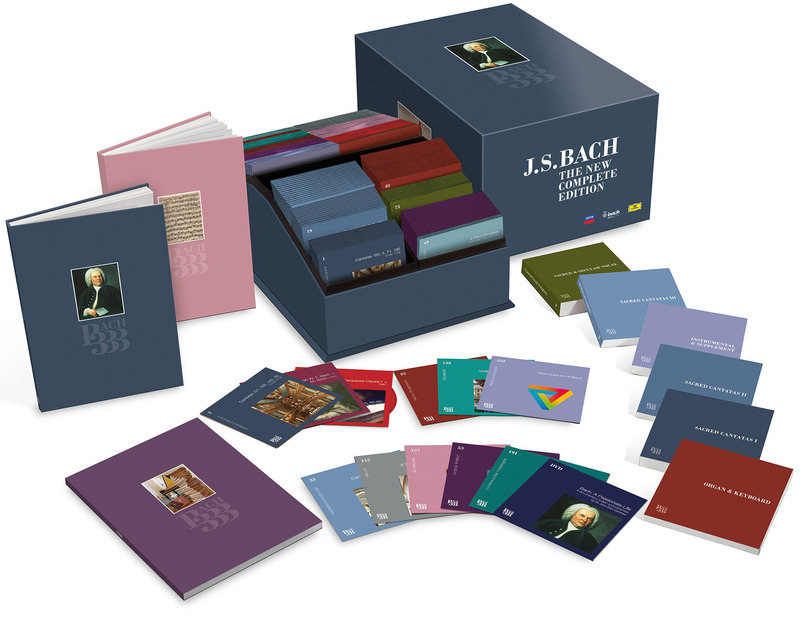 16 CDs entitled “Bach Interactive” and “Bach after Bach” form the basis of a major offering to enrich our experience and understanding of Bach’s unique impact on composers and composition ever since; from Mozart and Beethoven to today’s masters such as Arvo Pärt and György Kurtág. Included are albums devoted to Bach à la Jazz (Stéphane Grappelli, Stan Getz, Jacques Loussier, Bill Evans and more) and New Colours of Bach - remixers, composers and artists of our own time. Bach 333 is released worldwide on October 26th in two language versions – English and German. The flagship Edition is accompanied by a 2CD entry level product Peaceful Bach and a suite of 13 digital products including Bach à la Jazz and New Colours of Bach, all aimed at achieving the widest possible awareness and engagement. Colour-coded for easy navigation and ordered chronologically by genre. Lavishly illustrated biography by Dorothea Schröder, with a foreword by Sir John Eliot Gardiner; plus 13 new essays by leading Bach scholars. New essay by Christoph Wolff, 222 CDs of musical commentary by Nicholas Kenyon, many facsimiles and guide to online resources. Bach: A Passionate Life. 90-minute BBC film conceived and narrated by Sir John Eliot Gardiner. 2018 marks 333 years since the birth of Johann Sebastian Bach; music in Bach’s time went far beyond the superficial process of just placing pleasing harmonies on manuscript paper – it had religious significance and meaning built into its very structure. Of particular prominence in some of Bach’s music are references to the number three, reflecting the important doctrine of God’s Tri-unity which lies at the core of Bach’s Lutheran faith. So for Bach at least, 333 would have had real significance. The symbolism of three, representing the Father, Son and Holy Ghost of the Trinity, is everywhere in the collection of organ works Clavier-Übung III (1739). There are 27 pieces in the collection (3 x 3 x 3), perhaps epresenting the 27 books of the New Testament. The rather incongruous inclusion of the Four Duets BWV 802–805 which were probably not originally for organ, prompts speculation that they are mainly there to increase the total piece count to 27. The work opens and closes with the Prelude and Fugue in E flat major BWV 552 with its key signature of 3 flats. This is Bach’s only use of this key in a free organ work. The Prelude has 3 strongly contrasted subjects, while the Fugue is tripartite with 27 entries (3 x 3 x 3) of the theme in total. The nine (3 x 3) liturgical mass settings BWV 669–677 refer to the three of the Trinity in the Mass, with specific reference to Father, Son and Holy host in the corresponding texts. The “large” settings are momentous pieces of music where the first Gott Vater in Ewigkeit BWV 669 puts the chorale in the upper part. The second, Christe aller Welt Trost BWV 670 places the chorale in the middle of the texture as a tenor part. The final Kyrie, Gott Heiliger Geist BWV 671 places its chorale melody deep down in the pedal part. Here we have Trinity symbolism at work in both a literary and musico-pictorial sense. The significance of the Trinity to Bach’s thinking is expounded in one of his least-known, shortest, apparently simple and insignificant works, the one-line Canon Trias Harmonica BWV 1072. The term “trias harmonica” (harmonic triad) was coined by Johannes Lippius in 1612 and is a set of three pitches that can be stacked vertically in thirds. There are 10 hours of entirely new recordings including a new recording of the Sonatas & Partitas for solo violin by period specialist Giuliano Carmignola, as well as 7 premieres of works never recorded before - 6 alternative Chorale versions and Beethoven’s only completed arrangement of a Bach work. Watch our 13 Bach333 webisodes - a series of informative video interviews covering the most important questions and aspects of the edition. The flagship Edition is accompanied by Giuliano Carmignola’s new 2CD release of new recordings of the Sonatas & Partitas for solo violin, a 2CD entry level product Peaceful Bach and a suite of 13 digital products including Bach à la Jazz and New Colours of Bach. from jazz icons Loussier, Evans, Getz, Peterson and Thielemans to today’s artists, composers and remixers including Víkingur Ólafsson and Peter Gregson. Finally there are 2 digital bundles of legendary pianists and singers including piano performances from Gulda, Gieseking, Tureck, Demus, Badura-Skoda, Sviatoslav Richter, Weissenberg, Gavrilov and Horowitz; and vocal performances from Krebs, Wunderlich, Stader, Janowitz, Haefliger, Augér, Reynolds, Battle, Chappuis, Stader, and many more. Sign up to our DG newsletter to follow our unveiling the different aspects of the box individually in the run-up to release on 26 October.